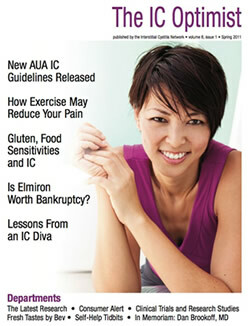 (1) Lessons From An IC Diva - This issue of the IC Optimist introduces the concept of an IC Diva. With strength, courage and a wee bit of an attitude, we live our lives with neither regret nor apology. Rather, we celebrate life and try to live it to its fullest. New ICN contributor Nyeema has written a brilliant, funny and inspirational story that will inspire you to fulfill your divahood! We love it. 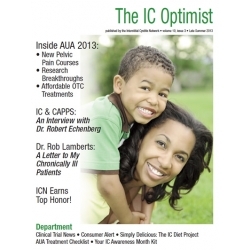 (2)New AUA Guidelines Released: New Diagnostic and Treatment Strategies for IC/BPS - The American Urology Association has released a new comprehensive clinical care document that discusses, in depth, how IC should be diagnosed and treated, with a much needed emphasis on compassionate pain care and management. You'll find their list of "Do Not Do's" to be fascinating, particularly the use of high pressure, long duration hydrodistentions. Much needed, this is a wonderful new tool that we hope that you will share with your physicians. 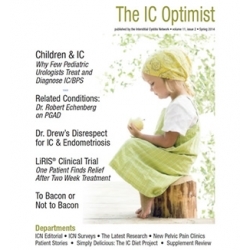 (3) In Memorium - Dan Brookoff MD - We lost an IC hero, the man who first recognized the often desperate need for pain care for urology patients, particularly interstitial cystitis. Small in stature yet with a heart the size of the Chrysler building, Dan Brookoff saved countless lives. He will be greatly missed. 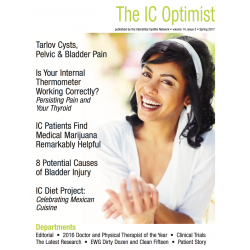 (4) How Exercise May Reduce Your Pain - ICN writer Stacey Shannon interviews physicians and patients about how and why exercise can reduce some, but not all, of our pain levels. From belly dancing (yes, belly dancing) to yoga, there are simple, easy strategies that you can use to improve your quality of life. (5) Gluten, Food Sensitivities and IC - Celiac disease and gluten intolerance are hot topics in IC support groups around the world. Could they be triggering some of our IC symptoms? Jill Osborne and Wendy Cohan RN discuss the latest research and share tips that you can use to determine if they could be playing a role in your health struggles. (6) Is Elmiron Worth Bankruptcy - Very few IC patients can afford to spend $700 or more on a monthly prescription of Elmiron and, for many, insurance coverage reduces the price to, perhaps a few hundred dollars per month. What to do if you can't afford the cost? (7) Fresh Tastes by Bev: Scones and A Spot of Tea - In honor of the royal wedding, we share some favorite IC recipes from England!